A BMW new model launch is something else. First they truck 20 bikes to a wild and beautiful island set in a shimmering sea. Then they fly a group of journalists down to join them. The bikes are tanked up, the hacks are tanked up, and a meeting is convened. The hacks clutch their shaken but not stirred and brace themselves for the product-concept-marketing-strategy market speak Japanese launches have conditioned them to. But no, the man from BMW thanks us for coming (!) and tells us to have a jolly good time and lunch is at Evisa anytime. We take our pick from the £80,000-worth of machinery lined up for our delectation (the robust take maroon bikes, the badly hung-over head for cool grey/green ones), and scamper off into the hills grinning like schoolkids. The island was Corsica, the bikes were the Kl00RT BMW range flagships, and the roads were evenly balanced between impeccable and awful. Corsica is a good place to find out a lot about a bike in just two days and a few hundred miles' riding. 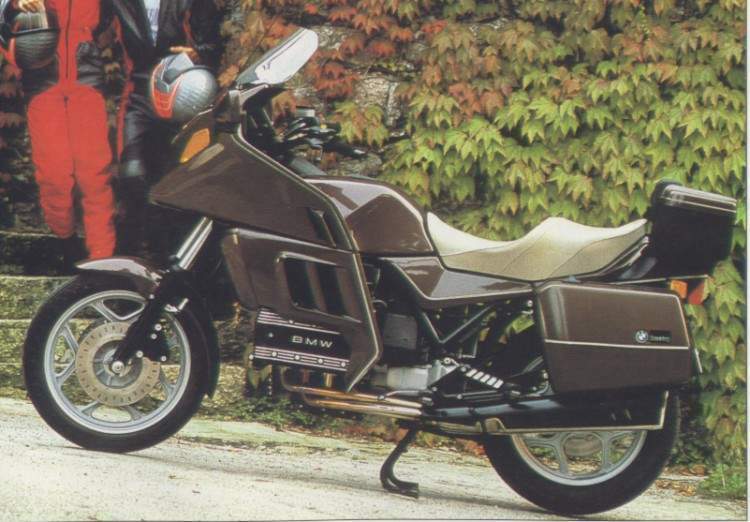 The K100RT is a very important bike for BMW. As soon as they can get over the production delay caused by the German metalworkers' strike it is going to be their biggest selling model so, even more so than with the standard K100 and K100RS, it must be 99 per cent right right from the start. Lessons have already been learned: the RT sports a redesigned seat in answer to criticism of the height of previous fours' bumperch. It's much better and will be fitted to all Ks from now on. 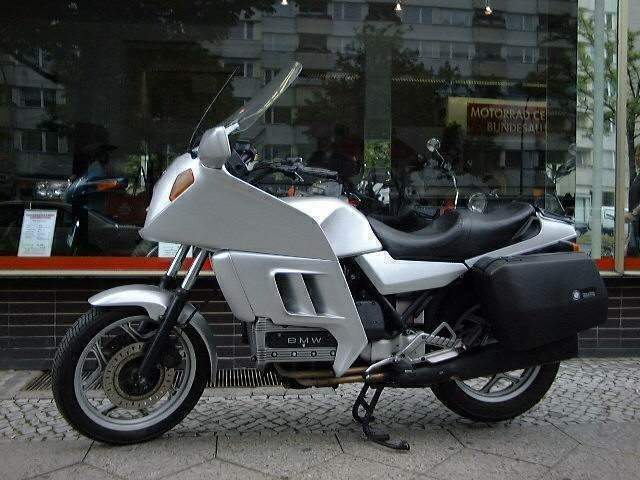 The RT is also the definitive BMW 1000cc four. 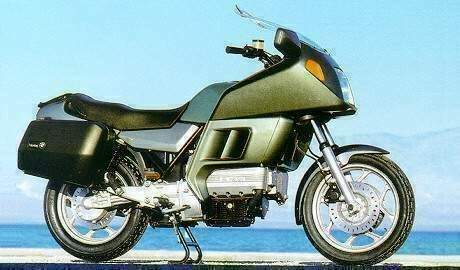 Although released last of all, it was the bike they had in mind all along look at the 'ordinary' K100, it looks like a faired bike which has lost its fairing. As a result, the new RT is nothing like the old top of the range twin. While there was no doubting the R100RT's fairing's effectiveness, neither was there any escaping the barn door feeling you received when sheltering behind it either. On the K100RT, you get on board and wonder where all that glass fibre reinforced plastic suddenly went. Several factors help the new RT's fairing achieve a good deal of protection from comparatively little GRP. The new screen is much lower and narrower than the old one but angles back sharply. It doesn't attempt to keep wind off the rider completely, but only the top of his head and the extremities of his shoulders catch any direct windblast. Nor is there any need to build a 34in-wide fairing to protect hands on 30in-wide handlebars when some lateral thinker in the design department has come up with mirrors which clip on just where they shield delicate digits. In this respect the RT is a little more successful than the RS, since the high bars mean the protector/mirrors are placed where they don't engender conflict situations with cars' door mirrors. The screen tops out at the level of a five-feet, ten-inch rider's chin, so you look over it: the view ahead is almost as good as on an unfaired bike, right down to a few feet in front of the wheel. The RT's lowers extend below the head and bottom (right?) end of the motor to provide shelter for your tootsies and are just wide enough to keep all but a hint of breeze off your shins. In short, it's a superb piece of design which is highly effective without dominating your view ahead or totally divorcing you from moving air. I mean, if you're after total wind protection, Mr Ford does a neat line in full fairings if you don't mind a couple of extra wheels. The test routes covered about 300 miles of Corsica's finest and most appalling main road: there's little rhyme or reason to it, they build a great road until the cash runs out and then just leave the bumpy, potholed old surface for 20 miles or so. The RT coped with the going better than a 500lb-plus tourer really has any right to. Corsica's roads are all bends — at best they're a scratcher's paradise and at worst just bloody hard work — but most of the test bikes quickly acquired hero marks on the footrests and centre stand. The smaller fairing definitely makes throwing the new RT around less intimidating than the original. Most criticism of the fours' handling centres around the long travel, softly sprung (though not as soft as most Yamahas') forks, but despite the absence of anti-dive, the springing and damping are well matched. Rubber mounting allows rather a lot of handlebar movement but the majority who buy the RT (presumeably) for total comfort above absolute control won't find this a problem. I never detected any flexing from the forks, or rear-end-induced wallows or wobbles, so the RT certainly looks as if it'll make it as a rapid, if not superfast tripper. Any doubts anyone might have harboured were answered by the guy who was supposed to be leading the way. A puff of smoke, trail of sparks and a rapidly disappearing backside was all most of us saw of him all day. One item still, surprisingly, omitted on the RT is a proper grab grail. Hell hath no fury like an insecure passenger but insecure is all they'll feel with the inadequate hand holds which is all BMW have provided. Even the factory press pics show a pillion deseparately clutching the rider's beer gut, her helmet jammed into the back of his neck. Could make the difference between picking the RT or an Aspencade. At £4595, the RT is only £100 more than the RS (tested on page 40) but offers the advantages of much better weather protection without too much penalty in terms of weight or barn-door effect. You also get the ABS panniers thrown in. From this brief tryout, the RT seems to offer a remarkable combination of comfort, protection, flexibility and speed. Corsica appears to possess only three stretches of fast, straight road and I had an indicated 130mph on one — over bumps and faced with very strong, gusting, cross winds. You can add 'remarkable stability' to the list.